Become Friendly with the Jorvik Fishing Club to start hunting the Legendary Fish around Jorvik. Speak with Mr Trout in Cape West Fishing Village to take daily fishing quests to gain reputation with the club. The Golden Roach is the biggest roachfish I have ever seen. Quick as lightning and clever as a sea eagle, nobody has ever managed to catch him. I think you are ready to try, Rita. The Golden Roach has been seen around the docks on Goldenleaf Stable’s island. Fish there and don’t give up easy… The Golden Roach is going to be harder to catch than any fish you have ever caught before. Objectives: Catch the Golden Roach. It can be found around the docks on Goldenleaf Stables island. Ride out to the dock on the southwest side of the island and catch the Golden Roach. Just like normal fishing, click when the bobber goes underwater for a chance to catch the fish. When you have finally caught it, return to Mr Trout. Wow! You caught the Golden Roachfish, Rita! Congratulations! I hereby award you the Jorvik Fishing Club Medal of the Fifth Degree. Wear it with pride and may good luck always be on your side. You know what Rita? Nope… You don’t know it yet. I haven’t told you yet! I thought it would be a good idea to broaden your fishing horizons so I contacted the Silverglade chapter of our fishing club and told them about you. So, it gives me great honor to present you with a personal invitation from Mr Cod, that is his name, to fish in Silverglade. Mr Cod is on the beach in Moorland below the lighthouse. Ride over and don’t forget to say hello for me! Objectives: Speak with Mr Cod below the lighthouse on Moorland beach. Return to Moorland and find Mr Cod on the beach, between the lighthouse and the Dark Core landing. Aha! Here is the next big fisherman! Welcome to the Silverglade chapter of the Jorvik Fishing Club. Yes, here in Silverglade we have some especially beautiful fish! I thought I would teach you some of my best fishing tricks, I hope you are ready. The most important thing when you are fishing is the bait. Without good bait, you might as well be fishing without a hook! The best of all bait is the earthworms here in Silverglade… They are like dill potato chips to the fish… And of course dill potato chips are the best! So, collect some earthworms for me and I will tell you more of my special fishing tips. The best place to get the earthworms is right by me here on the beach… Unfortunately those awful Dark Core thugs have set up their base there. But if you watch out for the guards you can still manage to get some good worms there. Here is the shovel, good luck! Objectives: Evade the guards at the Dark Core landing area and dig up some earthworms. Bring the worms back to Mr Cod. Dismount your horse and use the shovel in the three places on the beach to collect the worms. Bring them back to Mr Cod when you are done. Let’s see. Nice worms Rita! There, now we have bait. Before I tell you where to catch the best fish in Silverglade, I’d like you to help me inspect my fishing nets that are hanging up to dry around Moorland. I suspect those Dark Core thugs have cut some holes in them… So ride around and check that they are okay. They are out along the beach here in Moorland. Objectives: Inspect Mr Cod’s nets that are hanging up along the beach in Moorland. Go out down the beach and inspect each of the nets set out. Return to Mr Cod when you are done. Now that we have good bait, we need a really good hook. It isn’t good enough to just use any old hook you can find… It needs to be of good quality. Lucky for us there is a great blacksmith in the area that makes the very best hooks in Jorvik. Ride over to him and ask him for a really good hook. We’ll continue when it is ready. Objectives: Ride over and speak with the blacksmith in Moorland. Ride to Conrad’s forge and ask him for a good fishing hook that you can use. Nice to see you Rita. Hook you say? I only have one hook left. This is the best hook I have ever made and Jorvik will never see one this good ever again. I’d like you to have it Rita. Fish with reverence and enjoy my little masterwork every time you cast your line. Objectives: Ride back to Mr Cod with the hook. Take this fine little hook back to show Mr Cod. Ah. That is a great hook, Rita. Very nice. Are They Biting in Silverglade? Hello Rita! Beautiful day for fishing, isn’t it? So, now you have your bait and your new hook. What do you think? Are you ready for a little Silverglade fishing? Here on the dock there is a great place for fishing. Catch three fish from there and come back to me. Objectives: Catch three fish from the dock where Mr Cod is standing. Dismount your horse to begin fishing from the dock. Speak with Mr Cod when you have caught three fish. Every day I will have new tasks for you Rita. Complete them and you will raise your reputation with our fishing club and maybe our esteemed leader, Mr K Trout, will tell you where one of Jorvik’s legendary fish can be found. Mr Trout is ready to tell you about the next Legendary Fish. I think you are ready for a tough assignment, Rita. Have you heard about the Valedale Pike? No? It is more than one hundred years old and could be bigger than a horse if the stories are true. I have never seen it… But it is there… I’m sue of it! If you think you have it in you to try, ride over to Valedale Lake and look for a good place to try and catch it. Don’t give up easily… This is going to be a very hard fish to catch. Objectives: Catch the Valedale Pike. 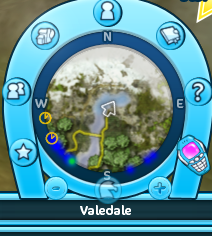 It can be found somewhere in Valedale Lake. The spot to catch the fish is near the Valedale oak tree, along the race track. When you have caught the fish, return to Mr Trout. Fantastic! I never thought I would see this day. The Valedale Pike is real! Wow, wow, wow! It is a great honor for me to award you with the Jorvik Fishing Club Medal of the Fourth Degree. Wear it with pride and may fishing luck always be with you. Return to Mr Trout when you are Popular with the Jorvik Fishing Club. The Moorland Monster. Have you heard of it? Listen up and I’ll tell you all about it. The legend of the Moorland Monster has been kept alive for over a hundred years. An absolute monster, as big as a whale, that every now and then appears off the coast of Moorland. But it isn’t a whale Rita, believe me, it sparkles like silver and never blows out air. I have seen it myself and I nearly fell out of my boat with fright! Go and catch the Moorland Monster, Rita… You are ready for the ancient monster now. Good luck and don’t give up… This won’t be easy. Objectives: The Moorland Monster lives in deep water. You need to go out on one of Dark Core’s boats by the Moorland coast to try and catch it. Ride out on the beach behind Mrs Holdsworth’s house and go to the barge with the dock extending out to it. To get onto the barge, jump from the end of the dock. Then dismount your horse and use your fishing pole as normal. Return to Mr Trout when you have caught the fish. Is it true? You caught the Moorland Monster?! Wow, wow, wow, WOW, Rita! It is a great honor for me to present you with the Jorvik Fishing Club medal of the third grade. Wear it with pride and may fishing luck always be with you! Return to Mr Trout when you are Admired with the Jorvik Fishing Club. There is one fish that I have tried to catch my entire life, but I have never succeeded. It is a true sea monster that has, time and time again, escaped from my nets. This isn’t just a big roachfish either… This is pure swimming evil! We call him Mr Evil. Where he swims, all other fish disappear… He empties the sea with his voracious appetite. It was Mr Evil that cost Bob his leg! It was Mr Evil that sank the previous ship of Captain Brus! Now I think you might understand why I am asking you, Rita, Jorvik’s best fisherman, to once and for all stop Mr Evil’s rampage. Are you ready to catch Jorvik’s ugliest fish? Good! This is going to be the hardest fish you ever tried to catch, Rita, so don’t give up! A good place to try and catch the monster is by my old fishing shack that lies at the outflow of the Silversong River by Firgrove. Right across from Fort Pinta. Good luck Rita, good luck! Objectives: Ty to catch Mr Evil beside Mr K Trout’s fishing shack that is at the outflow of the Silversong River on the Firgrove side. Directly opposite from Fort Pinta. Ride out to the beach around the ghostie grave. There is a small shack on a tiny island just off the beach. Walk out onto the plank to try to catch Mr Evil. He’s a tough one! If you live to tell the tale, return to Mr Trout. …You did it. Mr Evil’s reign of terror is over. Fantastic! Unbelievable!!! Wonderful!!! It is a gigantic honor for me to present you with the Jorvik Fishing Club medal of the second grade. Wear it with great pride Rita and may fishing luck always be with you! So completes the story quests with the Jorvik Fishing Club. You can continue to do daily fishing quests at your leisure and enjoy some time out at the water. Emma is done with her business at the riding arena. Hello again Rita! Hey Summerblaze, you are the world’s most beautiful horse! Now you need to help me. I need a ride to Goldenleaf Forest. Objectives: Give Emma a ride to Goldenleaf Fores and she can show you a new racing trail. Take Emma to the forest where you got the golden leaves for the race prizes. Here we are. Thank you Rita! Ta da! Here is Goldenleaf Forest’s racing track. Yes Rita. I don’t have a horse here, so it hasn’t been easy setting up a working racing trail… We’ll test it together and you can tell me what you think later. Come on now, pick me up on Summerblaze and we’ll ride it together! Yeehaw! Objectives: Get the fastest possible time. Ride the race track with Emma as best as you can. Wow… What a ride! I think the racing trail works well? Lickety split like my grandmother used to say! Alex is ready to catch the Dark Rider that is to pick up Justin’s horse. Let’s go see her outside the riding arena. Now it is time. I thought I would watch the Southern Gate here. I thought you could watch the southern beach in Goldenhills Valley, just down from the broken bridge that goes over the ravine that makes a natural wall between the beach and the Goldenleaf Forest, you know. I’ve marked the place on your map. I’ve sent other friends to other locations on the Golden Road, and around the Labyrinth Coast so I think we have the area quite well covered. Objectives: Ride over to your lookout post that Alex assigned to you. She has marked the location on your map. Go to the marked place to begin your stakeout. Time to play the waiting game. Objectives: Follow the Dark Rider. Don’t ride too close or they will see you… And don’t let them get too far away either. Follow the Dark Rider to the North Iron Gate. Don’t get caught! Objectives: Ride over to Southern Gate where Alex is watching and tell her everything you saw. Meet Alex by the South Iron Gate and tell her what you have just seen. Hey! Tell me what you saw Rita! The suspense is killing me! Okay then Rita! Well followed! So the Dark Rider took Justin’s horse past the Northern Gate? What is up there and who’s there? Why are they taking Justin’s horse there? There are questions we’ll never know the answers to if we can’t get past that gate in some way… Do you have any good ideas? Objectives: Tell Alex what you think we should do here next. See here, I’m full of good ideas! Hmm… You think we should ask Jasper if he has any idea what thee is behind the gate? And if he doesn’t know how to get past the gate we can ask Mayor Klaus for the Key to the City… Good idea! Does Jasper Have Any Ideas? Jasper is close by! We’ll see you at his place! Objectives: Meet up with Alex at Jasper’s and listen to what Jasper has to say. Ride over to the pumpkin farm and speak with Jasper. You are wondering what is past the Northern Gate? Well youngsters, it was a long, long time ago that I was there… But I’ll try to remember. Okay. It seems like someone is living beyond the Northern Gate and it just might be they are staying at the Mayor’s old summer place… Now we have something to check out. Ride over to Cape West Fishing Village and speak with Klaus. Ask him about his summer house and about his wife. Also ask to borrow the Key to the City so we can open the Northern Gate. I’ll watch the gate to see if the Dark Rider or anyone else comes out… Or possibly for anyone else coming in. We’ll see you there later. Objectives: Speak with Mayor Klaus in Cape West Fishing Village about his old summer home. Ride to the village and speak with Klaus. Oh. You know what? I think I have to rush off now. I’m pretty sure I won’t remember anything about that… I think I need to go right now. Bye bye! Objectives: Hunt down Klaus in the village! He is running away and doesn’t want to talk. Oh well. You can’t run away from your past. I’ll tell you everything. My wife and I were so happy together… And we had a wonderful summer house together beside a mountain lake north of the gate. But my wife became interested in hocus-pocus type things… And she began to brew strange witch potions. I was really worried about her. Finally, one day I returned to find our beautiful mountain lake had changed into a dark swamp! And my wife… She had turned into an evil witch! There was nothing I could do for her! It is my biggest regret… She is still there completely lost in her potions and witchcraft. So… You also want to speak to her? Yes, I would like to speak with her. I don’t think she will listen to a word you say, my friend. My dear wife is gone and that witch is all that remains. It breaks my hear just to think about it. For my part I would still appreciate it if you would try and speak wit her. You have helped me and the village a great deal already. Of course if there is anything I can do to help you, I absolutely need to do it. Here is the Key to the City. With this key you can also unlock the Northern Gate. Good luck now. If you manage to speak with my witch wife… Please tell her I still love her and would like nothing more than to have her come home again. Objectives: Unlock the North Gate and speak with Alex. Ride up to the Northern Gate and unlock it with the key. Then speak to Alex. The gate is open now… Hurray! I can take the key and give it back to Klaus later. I have some things to take care of in Cape West anyways. Okay then. Ride in and see if you can find the witch. I agree with you that the witch and the Dark Rider probably have something awful in mind for Justin’s poor horse. She can definitely give us some information on where we might find Justin. Be careful! I’ll keep watching the gate for as long as I can. I’ll be here if you need help! Objectives: Find the Mayor’s old house and his wife the witch. Ride north down into the swamp and ride on the boardwalk to the back of the swamp to get to the witch’s house. Be careful to not fall into the swamp water. Hahaha! Abracadabra! You think you can just walk in here and get me to tell you anything you want? You ARE funny! Now I think I’ll transform you and your silly horse to teach you a lesson! Ride back to the gate to speak with Alex. 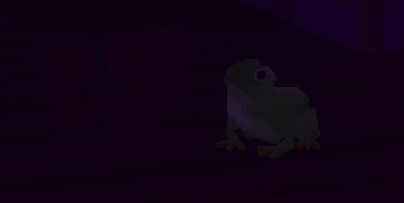 You were turned into a frog? Oh my… Luck it wasn’t for very long. So the Mayor’s wife is also the witch Pi and is not really that willing to help. And she has Justin’s horse in a big cage… Hmm… We need to think of something to do. Linda is pretty clever and isn’t too far away. Ride over to Linda at the Equestrian Center and ask her what she thinks we should do. I’ll keep watching the gate so nobody can sneak in and move Justin’s horse without us knowing about it. Objectives: Speak with Lind at the Equestrian Center. Meet up with Linda at the Winery stable and tell her what has happened. Heya Rita! I have a lot on the go right now but if you say it is really important I will absolutely help out. That’s what friends are for. Okay. I understand. You need a way to get that witch Pi to talk to you. Poor Klaus having his wife turned into a witch. Hopefully we can find a way to bring back Pi so she turns into the nice woman she once was. Well, I don’t have a solution in mind. I think we’ll actually have to do some research on this one. It is time to visit the Library. The Winery has a fantastic Library. I’ve spent many hours with my nose buried in those exciting books. Come on. Let’s go! Objectives: Follow Linda to the Winery Library. Go in through the east entrance to the main building. Walk with Linda to the Winery building, then dismount your horse to go inside the building. Meet Linda inside. The thing is we need to find the right book to find the answer to how to turn the witch back into her old, kind self… Or at least get her to talk to us and tell the truth. I’ll sit down here and start looking through the Witchopedia first. You can look through the library and maybe you can find some books about witches. If you find any, bring them here. Objectives: Look around for all the books you can find on witches and bring them to Linda. Walk around the library and pick up all of the books you can. Then speak with Linda when you have enough books. Nice find! Now we have a pile of exciting books about witches that we can work through. This is going to take a while. You can help me dig through a few of these books for how to make a witch more cooperative. Here, sit down and look through these four books. Objectives: Sit down and read the four books that Linda put out for you. Go through the four books on the desk in front of Linda. Speak with her when you are done with the books. Thank you for the help. You did find some useful information… But I don’t think we have what we need for a solution yet. Mr Loop has finished repairing Mr Trout’s things. There you go! All the traps are fixed now. Take them back to Mr K Trout so he can start catching crayfish again. Haha. Objectives: Take the repaired crayfish traps to Mr K Trout. Return the repaired traps, so he can break them again. Look at that! They look like new! Thank you Rita! There we go. The next is fixed again for now. I wonder what Mr K Trout is doing to break it all the time… Sawfish? Scissor Fish? Objectives: Take the repaired net to Mr K Trout. Fantastic! The net looks great… Just like new! He wondered what I was catching to break my net all the time? Sawfish? Does he think I’m dumb as a cod, or what? Back in the Crayfish Business! Oho! Now I need to ask you to put the traps back in their spots again. Would you mind? Come back to me later. Objectives: Place out the six traps in their places along the Longbridge. Put the traps where you pulled them out from before. When you put all of the traps out, return to Mr Trout. Thank you Rita. Now we’ll see how the crayfish jump into those traps quicker than a salmon can salmon in a … Well… You know what I mean. Well done at any rate! Now we can use it again. Ride to the dock farthest west and put it out there. Objectives: Put out the net farthest out from the west docks. Go to the end of the west-most southern dock, and place the net there. Return to Mr Trout when you are done. Thank you for your help Rita! You really need a lot of energy and patience to be a big fisherman like me, Mr K Trout. At first I thought you were a little minnow, but I’m beginning to think you have what it takes to be a big shark like me. Maybe you would be interested in joining us in the world’s best fishing club? We’ll see if you have what it takes to be a member of the Jorvik Fishing Club. Do You Want to Be a Big Fisherman? I have a suggestion, Rita. Do you want to be a big fisherman like me? If you say yes then I will teach you how to catch fish and then later you can earn extra Jorvik Shillings by helping me fish. If you think you have what it takes then we can see about making you a member in the Jorvik Fishing Club. All the best fishermen are members there. Every day I’ll need fish that are in demand. Fishing is the most fun thing ever. Do you want to be a big fisherman? Objectives: Speak with Mr K Trout. Great Rita! I’ll teach you everything I know! You will need to prepare before you fish. First and foremost you definitely need a fishing rod. You can buy that from Mr Loop at the fishing store. If you like you can buy fishing clothes there too… But you don’t really need it to fish… It is just cool to have. Why don’t you come back tomorrow when you have bought a fishing rod and I’ll let you test out fishing for a bit and we’ll see how it goes. You can buy the fishing rod now, or wait until tomorrow, but you will need to buy one from Mr Loop to continue the quests. Return to Mr Trout tomorrow. Conrad is ready to continue the forging of your new horseshoes. Welcome back Rita! You remember how we worked yesterday? Today we are going to do the same tasks again… But in a different order. Listen and follow my instructions carefully. I’ll tell you what to do next. Here, have my hammer and tongs, get ready to use them. It’s the same procedure as before. You know the drill. This looks promising! Now the metal needs to rest for the night again and then we can continue. But there is something we need you to fix now. The wood you collected is almost gone. Listen up Rita.The wood was used up really quickly! We need more… Much, much more. A huge amount of Ancient Oak! Ride back up to the wood’s edge along the Silversong River east bank and pick up a dozen logs of Ancient Oak. Objectives: Pick up a dozen logs of Ancient Oak from the eastern bank of the Silversong River. Return to where you picked up the wood the first time, along the Silversong Path. When you have collected enough logs, return to Conrad. Fantastic Rita! Let’s just hope we don’t use up all the wood now. We might need it for other work in the future. But it is your horseshoes that are the most important right now.